‘Achoo! Oh, Crap! My allergies are acting up again’ is a statement we can all relate to. You’re probably reading this because you’ve been looking for an all-natural allergy relief remedy. Well, good news. Your search is finally over. According to the research done so far, about one person in every group of five suffers from some type of allergy. That means, there’s a high probability that you or someone you know suffers to some degree from potentially debilitating allergy related symptoms. Most times, people experiencing an allergic reaction go to the doctor and are put on anti-histamines. I don’t know about you but I’m not a very big fan of medicaions. Anti-histamines mask the symptoms, but don't solve the problem. That’s why I’m always looking for the best way to deal with my illnesses in a more natural way. Don’t get me wrong. Sometimes it’s inevitable to take medications. Anyway back to the topic. In this article, we are going to talk about the best ways on how to get rid of allergies without medications. I’ll also discuss other important factors to help you cope with your allergies. Shall we get started? Allergy is basically a type of body reaction to an antigen (foreign material to your body). The body reacts by either sneezing, itching, difficulty in breathing, skin rashes and digestive symptoms. Your body reacts by producing histamine which counteracts the effect of the allergen. Seasonal allergy; is an allergic reaction that occurs when the pollen levels are high, so your symptoms would come and go seasonally. Food allergies; e.g. shellfish, egg or peanut allergies. Perennial allergies; occurs all year round and could be a reaction to dust or dustmite or a food group. Animal allergies; such as allergic reactions to dogs, insects or cats. Anaphylaxis; is a serious type of allergic reaction that can result in life-threatening situations. Certain foods such as eggs, soy, wheat, dairy and salicylates among others. With that in mind, you should learn how to deal with your allergies. 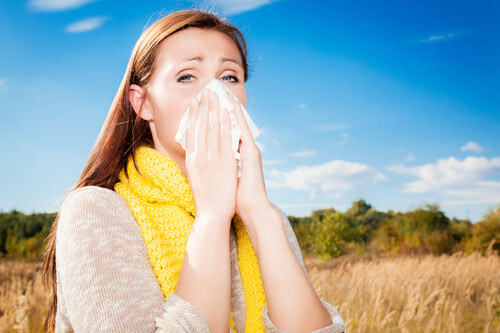 Natural treatments for allergies are a good way to stay healthy while alleviating your symptoms. In my opinion, I don’t think conventional medicines offer a long term solution. Your body reacts to an allergen since it senses it as something foreign. And, instead of getting to the root cause of the reaction, conventional medicines only focus on subsiding the symptoms of allergies. So don’t just focus on the conventional means; here are some of the home remedies for allergic reactions such as sneezing and skin allergies among others. For years, apple cider vinegar has and still is one of the best home remedy solutions. More to that, you can use ACV to help relieve your skin rashes. Drinking a glass of water with about one teaspoon of apple cider vinegar and a bit of lemon to add flavor will help you keep your allergies in check. You can also drink a teaspoon of apple cider vinegar every time you have an allergy attack. Additionally, placing diluted ACV on your skin may help reduce the itchiness. Add a taste of that sweet honey to your home. Raw honey is ranked as one of the best spring allergy remedies. This may sound like too sweet to believe but I guarantee you, having this ancient remedy in your home might be the best solution. If you are looking for pollen allergy remedies, then pay close attention to this part. Several studies have proven that raw honey results in the reduction of allergic symptoms. I recommend you to take at least one spoon daily mixed in a cup of tea or even your favorite smoothie. Honey has high levels of bee pollen which is able to counter the effects of infections or allergies and at the same time boost your immunity. Bees collect pollen from one flower to the next. That is why it makes perfect sense that consuming honey will build your resistance to pollen. Before anything, you should start eating anti-inflammatory foods. This will help reduce the chance of allergies among other health complications. You need to take better care of your body and hence bring it to perfect balance. That way, your body will be able to repair itself and fight off allergies in your environment. Garlic; packed with natural antibiotic properties, garlic will help reduce infections and allergies. Tumeric; the active ingredient of tumeric is curcumin which is reported to have antiallergic properties with inhibitory effect on histamine release from mast cells. Bromelain; this anti-inflammatory substance found in pineapples helps digestion, skin conditions and sinus complaints. Reishi mushroom; reduces the release of histamine and it regulates the immune system. It is beneficial for chronic and allergic asthma. Black cumin seed oil; extremely beneficial for allergies, asthma, headaches, digestive disorders and pain. It boosts the immune system and fights infections. One of the most interesting thing about eucalyptus is how it can relieve allergies fast. Once you put a few drops of Eucalyptus in a neti pot and inhale using a diffuser, you will start feeling the effects in a matter of minutes. Quercetin is a naturally occurring ingredient that’s found in plant foods such as, onions, citrus fruits, and cruciferous veggies. This ingredient is a bioflavonoid which means that it’s able to stabilize histamine. When the levels of histamine in the body are controlled, the allergic symptoms will subside. Studies show that Quercetin is able to reduce the effects of allergies because it has a way to calm down the hyperactivity in your airways. Quercetin can be taken as a supplement or you can increase your food intake of foods containing quercetin to decrease your symptoms. Allergic reactions can either be severe or mild. Mild symptoms can be often eliminated using home remedies. You can also get an allergy test to determine what it is you are reacting to. Often the culprit is easy to avoid, but when the culprit is environmental and exposure is inevitable, there are different non invasive modalities such as homeopathy and kinesiology that can offer a long term relief.